You may think you know the story of Rapunzel . 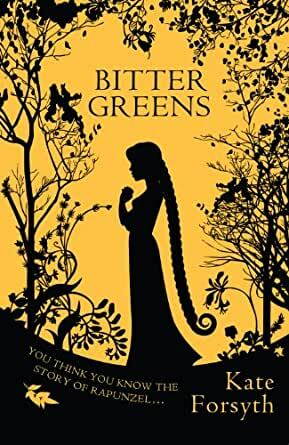 . .
"Bitter Greens" by Kate Forsyth details the story of Charlotte-Rose de Caumont de la Force, the French storyteller who is best known for her story Perinette--or Little Parsley which became widespread under the more familiar title, Rapunzel. Forsyth does a fine job of crafting a woman of great emotions and passions who must tread softly as a Huguenot in the Roman Catholic court of the Sun King, Louis XIV. Her story begins rather depressingly as the heroine is remanded to a convent by order of the king and must sacrifice her lovely clothes, her freedom and all her other privileges due to her scandalous behavior. Forsyth's depiction of the convent, its cruelties and hypocritical women is balanced only by Charlotte-Rose's narrative of her former life and her dreams for her future. Some readers may become lost as Charlotte-Rose flips from one part of her life to another in an order not always chronological. Nevertheless Forsyth's magnificent handling of her character proves her mettle as a writer who can not only depict the times and circumstances of 17th century France but can build a character of great nuance and power. As with all good stories, there is a lesson to be learned. While in the convent, Charlotte-Rose learns a bit about humility when she comes in contact with an older sister who entertains her with a version of the Rapunzel story that reveals a great truth. This fairy tale is encrusted with pain, vanity and passion like the original version of Rapunzel that was included in the original collection of the Brothers Grimm and criticized for its inappropriateness for children. The nun's tale is woven within Charlotte-Rose's own story which makes for an entertaining and suspenseful break from the dreary life at the convent. Forsyth's language and narrative is extremely well-done. I listened to the unabridged audio version of this novel and was pleased by the performance by Kate Reading. If you are a fan of Forsyth's you might recognize some of her descriptions and scenarios from other novels, but even if this can become repetitious, it does not detract from the overall enjoyment of the tale. Bottom line? Kate Forsyth's "Bitter Greens" is recommended to all those who enjoy a detailed adult version of a popular fairy tale--in this case the beloved story of "Rapunzel." For those who are gentle readers, Forsyth does not pull any punches--her tortures, punishments and sorrows are very much on point. Recommended. This fascinating book is a reworking of the fairy tale Rapunzel woven into the story of Charlotte-Rose Caumont de la Force, who wrote and published a version of the story while locked in an austere French nunnery in the 1690s. There is mystery surrounding how she came to hear of the story, originally published in Italy some 60 years earlier in a dialect Charlotte-Rose would not have been able to read. Charlotte-Rose had a carefree childhood running wild on her family's estate in Gascony. However, after her father dies, although her mother is managing the estate fine in her own the king decides she and her sister Marie need a strict guardian in charge and her mother is banished to a nunnery. Charlotte-Rose is smart and feisty and decides that since she is not beautiful she will go to court in Versaille where she can remain a single woman as a member of the royal household of Louis IX. Charlotte-Rose had always been a great teller of stories and entertained the ladies at court as well as some of the gentlemen with her tales and even published some under a pseudonym. When her scandalous behaviour and forthright manner eventually displease the king he sends her to a nunnery for punishement. It is here that the author suggests that she heard the story of "Persinette" (little Parsley) later to become Rapunzel when retold by the brothers Grimm. I really enjoyed the way the novel is written as a historical fiction surrounding the life of Charlotte-Rose and the fairy story of Rapunzel. The mixture of the politics of the Sun King's court with the rise and fall of women at court who must agree to the king's every whim or be rapidly banished from court makes for an intriguing story on its own. The story of Rapunzel is also a powerful story of the way in which women, particularly poor women were treated in the 16th century and that we come to feel pity not only for the girl locked in the tower but also for the witch who put her there. Great Story - highly recommended if you enjoy historical fiction. A fairy tale core, romance, witchcraft, strong women, art and seduction....historical fiction in all its glory. Charlotte Rose de la Force has been banished from Louis XIV court (Versailles) to a nunnery where she fights against losing her independance (and ability to write stories) and whilst struggling to fit in is sheltered by an older nun Seraphina. Seraphina shares with her the tale of Persinette; a young girl captured by a powerful witch as punishment for her parents stealing some 'bitter greens' (parsley and rapunzel)from her garden. Bitter Greens looks at the lives of strong women in the 1500's and 1600's in France and Venice. Charlottes story is the main vein that holds the story together, but the story of Rapunzel and the witch (Selena Leonelli - La Strega Bella) and their relationships and journey adds flavour and a sense of surrealism to the story. Charlotte Rose is a true historical figure and her story is intriguing on its own. I felt at times that the two stories would have been better suited apart, as I would get swept up in the fairytale-ism of the Rapunzel story and then be swept back to the historical style of Charlottes tale. An interesting look at the desires of women and what inspires and motivates them. At a time when women were either wives, whores or witches it is a real insight into the moments that could make or break a woman and how love is at the core of everything. A wonderful tale and a recommend to anyone who loves history, romance, drama and touch of mysticism.